My blog is a bit dominated by the Ocean Row with my son Daniel in 1997. I am in the process of sorting out my papers, to finally get round to writing a book. I am so often asked if I have one when I am on speaking engagements. I feel it is time I get round to it, consequently I am reading both me and Daniel’s logs, nowadays called blogs I suppose and being swept back to that amazing period of my life. Last week I said we started the race on 13 October, but actually it was the 12th, but did not begin the logs until the second day. The first week was a baptism of, not fire, but water! We were thrown all over the place, constantly wet and, at first, always exhausted. Daniel was ill for the first few days, me doing most of the rowing, which was actually psychologically very good for me. I had been fine at raising sponsorship and organising the logistics for the race, but did wonder in my heart whether I was capable of rowing 3000 miles. Those early days showed we were a team; Mother and Son Team. Daniel, once recovered, was definitely the No. 1 Engine, but I did my share. We began to get the hang of it, as Chay Blyth had once said. We eased the boat up one ridge wave and gently sliding down into the trough. We found it so exhilarating, both feeling it could become quite addictive, though truth to say the novelty over 101 days did wear off. We found everyday life such a chore…moving, going to the loo, writing, checking and maintaining our equipment with the constant movement of the boat. This was all such hard work however our spirits were high, as we were always so full of wit and humour, laughing and joking all the time! 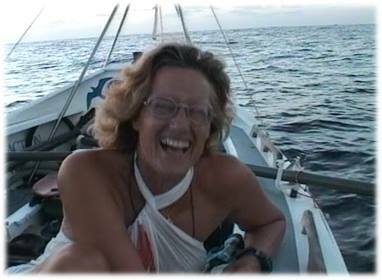 When rowing we found ourselves entirely alone; no land, no birds, just the endless ocean. The only sounds to be heard was water lapping against the side of our boat, ‘Carpe Diem’ (the name of our beloved boat). The creaking of the oars. That first week we had a glorious Harvest moon. It hid behind the clouds and we noticed that every time we dipped our oars into the water we disturbed fluorescent plankton or algae, which whirled and glowed in the darkness resembling a thousand emeralds. It was just so beautiful. I notice Daniel described it as a ‘tiny galaxy’. We had glorious dawns and sunsets, beautiful night skies with so many stars. 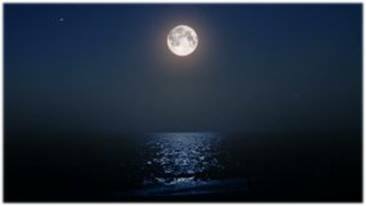 Similarly this week in Bexhill there was a wonderful Harvest moon, and when my husband Peter and I drove up to Galley Hill to see the beautiful reflection in the sea it made me think of how our lives are now. Daniel travelling extensively in his job, married and a father of two delightful little girls…and me remarried after many years as a Widow, living by the sea. My work these days sees me traveling round the country, speaking to diverse audiences; Corporate, Charity events and schools, about that ocean adventure all those years ago. The Ocean Rowing Society whenever it meets socially always has a THIRD TOAST: For those at Sea. 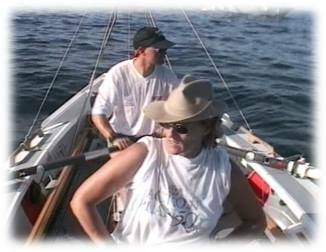 ← October 13th, The start of it all…The 3000 miles Rowing Race! OMy! We did the same thing, being prompted by my little brother, we finally rented Lost (BTW in the last disk -6 I think- of season one there is a disk with the entire season on it….of course I only found this out once I had rented the other like 5 or whatever! ANyway, now I have been downloading the new season onto my ipod to wa#;t&h8230c.cant get enough, we dont even watch TV, ah, I mean *didnt! 🙂 Stumpy is adorable!